Here at the Rapid Web Services offices, we all like cake. Rightly so as well, because cake is fantastic. On a related note, we’re deliciously happy to announce the launch of the ‘Love at First Bite Cakes’ website. Here’s a quick snippet from the website describing the personal history of Love at First Bite Cakes. A lot of people ask me if I’ve been to college to learn my skills, but my training was more traditional… I’ve learnt them through the family business! Just before I was born my parents opened Parkside Bakery, which they owned until about 5 years ago. Most of my happiest childhood memories are being there, cleaning and helping make the cakes. When I finished school I began working at their shop in Stafford hospital making all the shop cakes (flapjack, shortbreads etc) and got creative by changing recipes and design. Eventually I moved to their main bakery as head of confectionary, helping with all food production and started making birthday cakes, with help from my dad. Seeing how interested I was in celebration cakes, and once showing me everything he knew, he sent me around the country for a year, working for the countries top cake decorators and chocolatiers. Therefore my training was informal and experienced based. In 2006, they opened a cafe in Stafford town which I became manager of. The shop before used to sell a lot of birthday cakes, so I had a small base of customers asking me to make cakes for them, and from there my cake business grew. 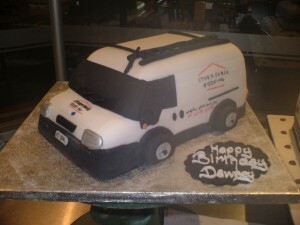 Within a year I had enough customers to call cake decorating a full time job! The Love at First Bite Cakes website is a fully custom web design and template based on a provided logo which was well integrated into the desired colour theme and style. The website promotes some fantastic celebration style cakes primarily and the custom web design reflects this target audience. We also gave Love at First Bite Cakes business specific advice in the web presence promotional fields of social networking and social media, meaning you can now follow them on Twitter, Facebook and soon flickr. If you’re interested in putting together a fantastic website to promote your business or if you just want some advice on how to promote your existing website, feel free to get in touch. There is a lot we can help you with – take a look at our portfolio. Rapid Web Services – turning cake into code.